The San Diego Unified School District Board of Trustees is expected to approve a resolution Tuesday that would extend an invitation to Secretary of Education Betsy DeVos to visit city schools. The invitation would come on the heels of a visit that DeVos made to a Washington, DC, middle school Friday in which protesters caused a delay in her entering the campus. San Diego Unified’s plans were revealed in documents that were released late Friday with the Board’s agenda for next week’s regularly scheduled meeting. The idea for the invitation was brought forth by Board President Richard Barrera and Trustee John Lee Evans. Nowhere in the resolution or on the agenda is DeVos mentioned by name. 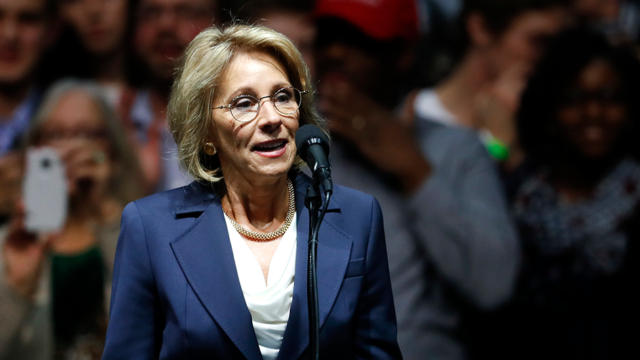 DeVos was considered by many to be one of President Donald Trump’s most controversial cabinet selections because of her lobbying for private school vouchers, charter schools and other public school alternatives.